Triumphant Victorious Reminders: July 25, 2010, "Pursuit of Holy God"
"...And one cried to another and said, Holy, holy, holy is the Lord of hosts; the whole earth is full of His glory!" "Wherefore gird up the loins of your mind, be sober, and hope to the end for grace that is to be brought unto you at the revelation of Jesus Christ; As obedient children, not fashioning yourselves according to the former lusts in your ignorance: But as he which hath called you is holy; so be ye holy in all manner of conversation; because it is written, "Be Ye Holy; For I Am Holy"." The pursuit of God's Holiness. In the pursuit led by passion, I become more aware of God's Awesome, Majestic Holiness. No wonder when Isaiah saw in a vision, as recorded in Isaiah 6, the Lord sitting on a throne, high and lifted up, seeing and hearing the declarations of God's holiness; Isaiah said, "Woe is me for I am undone and ruined, because I am a man of unclean lips, and I dwell in the midst of a people of unclean lips; for my eyes have seen the King, the Lord of hosts!" Our pastor exhorted us by the power of The Holy Spirit in clothing our minds; being sober; being aware. He asked us, "What is the opposite of sober?" Some answered, "to be drunk" another answered, "intoxicated". He said, "Yes; but it is necessary to remember that the opposite of soberness is be unaware." When someone is under the influence of alcohol or another form of drug, it causes them to be unaware of the things around them, causing awareness and alertness to slip away. He then gave us a simple example of someone driving under the influence. The one under the influence becomes unaware of the things around them which results in a disconnect or impaired thinking. However, when we become aware of our God and His Holiness it causes the former influences or lusts to go away. He said, notice the word 'former' as stated in I Peter 1:13-15. When we lust after something, we go after it with passion. Those former lusts equipped the emotions with such a passion which hinders enduring temptation. However, there is a lust that we must be driven by and that is a lust or desire after Holy, Almighty God. Lust must be a tool to passionately seek after Holy God! When the passion for our God is active; our passions are transformed, changed. The ways of the world are no longer a seductive tool; but the lusting passion for our God becomes ever growing. This passion which is ignited for Holy God causes change in the way we speak. The passion for Holy God causes change in the way we live. The passion for Holy God causes change in the way we look at ourselves. Furthermore, the passion for our Holy God changes the way we see Him; which is High and Lifted up! The mountains, the valleys, death, obstacles of every kind attempt to seduce us from seeking His face; yet the passion for Him will be the influencing motivator as we are moved with great action towards The Immovable, Holy, Indescribably Awesome God! As we are moved by holiness because of our God who Is Holy we will see the reward of walking passionately in pursuit of God. The pursuit of passion will remove the disabling stumbling blocks of our former lusts as we deeply disdain and despise those former things. As we despise those former lusts we see that it is due to securing ourselves to the Truth of Jesus Christ who made the way to have a relationship with Holy God. In this sobering awakening we become more aware of truth and by default ignorance slips away. The hindrances of ignorance or not knowing Truth is dispelled because we have girded our minds with the awareness of Who He is, revealed by Jesus Christ! I am passionately reminded of why we must passionately pursue our Holy God: "For everything that I'm capable of doing, everywhere I am capable of walking is directly related to what has been established in my mind. The 'all manner of conversation' in I Peter 1:15 is referring to how life is walked out - directed by the passions and beliefs of the heart." ~ Pastor Stephen Behrman. "Hear, my son, and be wise, and direct your mind in the way of the Lord." "For each tree is known and identified by its own fruit; for figs are not gathered from thornbrushes, nor is a cluster of grapes picked from a bramblebush. The upright (honorable, intrinsically good) man out of the good treasure [stored] in his heart produces what is upright (honorable and intrinsically good), and the evil man out of the evil storehouse brings forth that which is depraved; for out of the abundance of the heart his mouth speaks." "For the rest, brethern, whatever is true, whatever is worthy of reverence and is honorable and seemly, whatever is just, whatever is pure, whatever is lovely and lovable, whatever is kind and winsome and gracious, if there is any virtue and excellence, if there is anything worthy of praise, think on and weigh and take account of these things [fix your minds on them]. Practice what you have learned and received and heard and seen in me, and model your way of living on it, and the God of peace...will be with you." Be blessed as we our reminded that as we rely on Holy God; our awareness of Him will change our mundane ways; and into His purposeful, advancing ways! 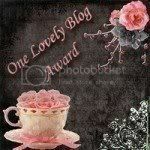 Also, check out the following blog it is a new blog that a dear friend who is my pastor's wife just started yesterday. I believe you will be blessed as I was. There is great insight from the Lord through her as she passionately pursues our God. May we as followers of Christ be led by a genuine passion in our pursuit of Christ. Thanks for sharing another heartfelt and encouraging post. I really like the idea of pursuing God. I probably wouldn't have used the word "lust" in this context, but you found a way to show that it's a passion for God and I like that. good post....I want to pursue Him...when I'm in His presence.....I feel so strong and confident.